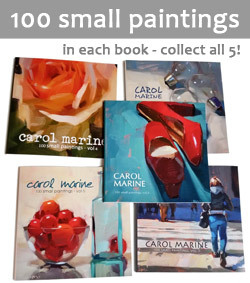 Carol Marine's Painting a Day: "Toppled"
I liked this composition so much I did a larger version too. 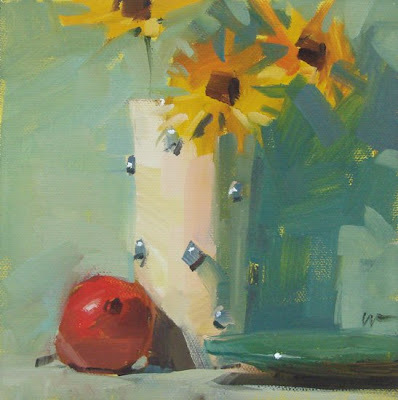 It will be at the "Grand Affair" show at the Wally Workman Gallery in January. Someone asked me today if I use a palette knife. I don't. But what I do ... do, is use crisp flat brushes. I buy good brushes (lately Silver Bristlon brights - the flats are too long for me) and every time I wash them I wrap them up to keep them flat. Below is a photo of the process. 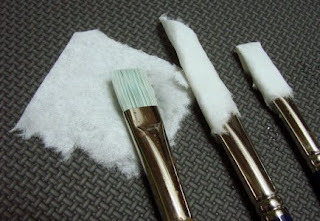 I used to put each brush up in the ... crack of a folded piece of cardboard and clamp the whole thing, but I realized after a while that I get the same results with just the paper towel. I fold the end down so it stays closed on its own. You use a delightful color palette. This looked so lovely and fresh in the thumbnail in my blogroll that I had to come for a closer look! That's an interesting tip about your brights. That plate is incredible, both the shape and the highlight! This is my favourite of your works, so far! Beautiful. Thanks for the tip on the brushes. This is such an appealing composition and the colors are wonderful. I look forward to seeing your latest painting every day. And I'm glad you told us a bit about your brushes because one of the things I always notice is that you create rounded form with what looks like short flats... and now I can see them even if I never manage to get to one of your classes. wonderful, Carol. I like it too. Thanks for the demo on the brushes...we never stop learning! I kill my brushes, thanks for the tips!!! Interesting idea about brush care; thanks for sharing it. I use a thin coating of gum arabic on my brushes, especially sables, after washing them. It dries hard and stiff in the position you shape the brush with your fingertips, and extends the life and shape of your brushes. Just rinse with water when you are ready to use the brush and you are good to go. Beautiful painting. Thanks for the tip on the brushes I will try it. Happy New year. I'm going to try your tip. Thank you very much!! Hmm, I've been using cardboard. I'll try the paper towel instead. Thanks.